Last month Crenshaw students boarded a boat in Marina del Rey and set out to sea on the voyage of educational Marine Biology adventures with Reef Check Foundation. This trip was a highly interactive marine conservation course, taught by trained marine scientists that gave the opportunity to our students the chance to become marine biologists for the day. During the cruise, we watched dolphins and whales. Students used a microscope to observe living plankton swimming across the computer screen. Students also learned how to test the chemical properties of seawater to determine pollution levels. Sprint in partnership with LAUSD, wants to donate 1 Million free hot spots and computers to Title I students across the nation. We were able to distribute 24 Google chrome books with hot spots, back pack and earpieces on March 7, 2018. We look forward to serving more students next year. On Thursday, February 22nd Crenshaw partnered with special guests Vegan Outreach to educate faculty, students and parent about healthy eating and vegan meal options. Founded in 1993, Vegan Outreach is a 501c3 nonprofit organization working to end violence towards animals. They plan community food sampling events, guided vegan grocery shopping tours and humane education for different middle schools, high schools and colleges across the country. Vegan enthusiast Chef Corby, discussed with the stakeholders the importance of using organic, natural ingredients, growing your own food in a garden if possible, and how you can spiritually connect to the earth through gardening. They provided vegan tacos using jackfruit in place of meat, lentils and coconut flour tortillas. He also made a cashew based sour cream, a vegan hot sauce and used arugula. Here's a quick commercial, produced by our very own Assistant Principal Mr. Guy Quinn, about some of the great things we have to offer here at Crenshaw Magnet High School! In the Crenshaw home where the Ebiriekwe brothers grew up, the family edict is that education is key. The three brothers' report cards prove the point. Kevin is a 6-foot-6 senior basketball player for Crenshaw, averaging 19 points with a 3.2 grade-point average. Steven is a 6-7 junior also playing basketball and an honors student. The oldest, Chemize, is a 6-5 former basketball player who's student body president at San Diego State. "My parents are very big on academics and education so we can have great opportunities," Kevin said of his mother and father, who came from Nigeria. Crenshaw (21-6, 8-0) has won 16 City Section championships in upper division basketball. The Cougars won consecutive Division I championships after the creation of the Open Division the last two seasons. They want to play in the Open Division this season. A win over View Park Prep on Feb. 7 should clinch it. And count on the Ebiriekwe brothers to deliver. 2018 marks the 50th Anniversary of our beloved Crenshaw High School! This Tuesday, January 30th at 10am, we will be kicking off our year long celebrations right here on our quad. All parents, community members and alum are invited to join us in this special occasion. Please wear your Crenshaw gear in support of our efforts. We look forward to having a great time showing our COUGAR PRIDE!!! Coach Garrett Wins NFL High School Coach of the Year! Due to his excellence on the gridiron, the Los Angeles Chargers are proud to award Crenshaw High School's very own Robert Garrett as the team’s Don Shula NFL High School Coach of the Year. Garrett is one of 32 coaches nominated by each NFL team for displaying integrity, achievement, and leadership exemplified by the winningest coach in NFL history, Don Shula. Garrett has been at the helm of Crenshaw’s football program for nearly three decades. Currently, there are six Crenshaw alumni on active rosters in the NFL. This season, Garrett led the Crenshaw Cougars to an impressive 12-3 record including a 5-0 record in tough league play. They ultimately won a 46-43 shootout over Placer High School to win the 2017 CIF Division 4-AA State Championship. Garrett will be invited and recognized in special ways during the NFL’s week-long celebration of football at the 2018 Pro Bowl in Orlando. He will visit Pro Bowl practices, participate in the USA Football National Conference and attend the Pro Bowl at Camping World Stadium. 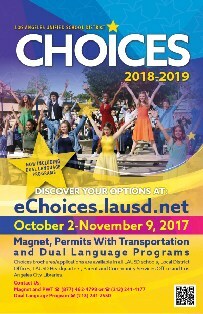 The Magnet Application for the 2018-19 school year is available online. You can still apply for the current 2017-18 school year as well if you are planning on attending Crenshaw for the Spring semester. We look forward to having all future Cougars! Steppin' in the Right Direction College Fair! This past Saturday several students attended the Steppin' in the Right Direction HBCU Fair in Long Beach, CA. Several students were granted onsite admissions and scholarships to schools such as Southern University, Paine University, Benedict College, Miles College, Alabama State University, and many others. We look forward to taking our Cougars to the Black College Expo, February 10, 2018 at the Los Angeles Convention Center for the opportunity to be admitted to even more schools! Any students interested in attending please see Ms. Hardridge or Ms. Pelikhova for details. The SSC will be held tomorrow at 5pm in the parent center. We welcome the newest elected members Ms. Watson and Ms. Kain to the council. All stakeholders are invited to participate. We look forward to seeing you tomorrow!